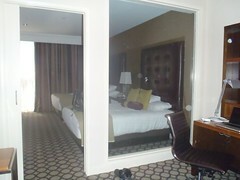 This trip was the 2nd time we have stayed at the Hyatt Regency Orange County. Last time we stayed here was back in 2005 for my 18th birthday. That time we had a 2 bedroom suite, although I think we booked lower and got upgraded due to Mom's Hyatt Passport status. This time we used Hyatt Points for a regular room and at check in ended up upgraded to a one bedroom accessible suite because they noticed Mik was in a wheelchair when we checked in. We do not usually bother about getting an accessible room, except on Disney Cruises, but it certainly was nice to have a roll in shower. Mik was hesitant to use the roll in shower. He is a creature of habit and hates bathing anywhere, but his own tub and bench. 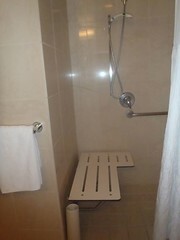 However, the fold on bench in the roll in shower was way better than the set up he has at home. 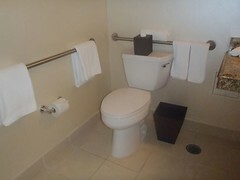 Mik does not like handicap toilets, which of course this room has. They are too tall for him, but he did appreciate having a bar at least on one side of the toilet, although not too helpful with it being on his right side and him being such a lefty and it still not being all that close to the toilet. However, still better than a regular room, especially since overall it has more space for us to help him. 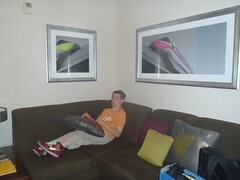 Mik enjoyed the couch because he could sit in the corner with his leg in front of him and be facing the television. He also liked that you could pull down the blinds between the couch area and bedroom to block out the light from the other room. 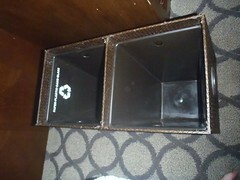 My favorite feature of the hotel room was that they actually have a split trash can with a can for trash and one for recycling. Totally love that you can recycle, especially since we often ended up with soda bottles we started at Disneyland and then finish after we got back to the hotel. It is also nice that the rooms actually have mini fridges. This is definitely one of our favorite Disneyland area hotels, although partly because we use Mom's points to stay free. We already booked another trip to go for my birthday and stay there this October. It works out good when we drive to Disneyland and we have our Premier Passes to park free at Disneyland, but if we had to pay to park at Disneyland (still have to pay to park every day at Hyatt) or fly it is not a good choice because it is just a tad too far to walk with all the walking you do in the parks and the shuttle can be inconvenient waiting around for and having to request the wheelchair one.